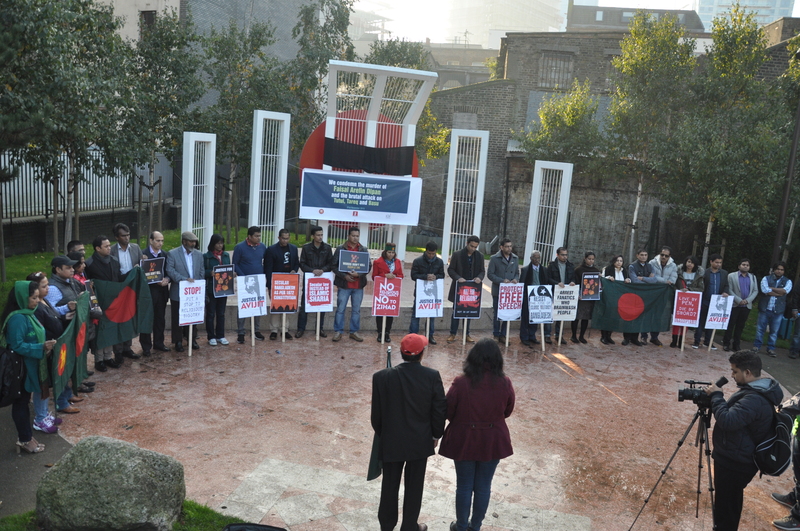 Bangla Community Blog Alliance (BCBA), a coalition of Bengali community blog platforms, in collaboration with Sachalayatan blog, and International Crimes Strategy Forum (ICSF) organised a protest on 1st of November 2015 in Altab Ali Park, London, in response to the brutal murder of Faisal Arefin Dipan, who was one of the publishers of Avijit Roy. The protest event was also in response to the other attack that critically injured publisher Ahmedur Rashid Tutul, writer-blogger Ranadipam Basu, and young poet Tareq Rahim. Both attacks were admittedly carried out by Islamic extremists. People from all walks of life from different parts of UK, including activists, and campaigners from British mainstream human rights groups participated in the protest. Although all were undoubtedly saddened by these losses, everyone present expressed their strong resolve to continue to act against these atrocities by upholding free speech, and to challenge the impunity that is existing in every turn. The gathering reiterated their commitment to carry on the struggle until religious extremism in all its forms is eradicated, towards building a truly free Bangladesh where the secular values of the Liberation movement will be reinstated. The gathering, in unequivocal terms, also demanded of the Bangladesh government – upholding the rule of law through prosecution of the perpetrators; security of writers, bloggers, and activists; and a clear statement of principle to uphold the constitutionally guaranteed freedom of expression, come what may.